Coconut oil has definitely become more popular these days, in light of the fact that it has gotten a bad rap in the past because it’s a saturated fat, thought to be harmful for your heart. Quality coconut oil actually provides a source of healthy saturated fat that nourishes the heart, supports hormone production, improves memory and cognition, and strengthens the phospholipid layer of every cell in your body, not to mention the great healing benefits when applied topically. Many of our new clients who are not familiar with coconut oil ask, “What do I do with it?” There are many great uses for coconut oil, not the least of which is cooking with it. You can use coconut oil to roast vegetables in the oven. It’s particularly good for making sweet potato fries or roasting beets in the oven, although you can use it to cook any vegetable. Coconut oil has a sweeter taste, so it complements the sweeter vegetables. If you want a really crispy skin on your chicken when you roast it, douse it with coconut oil, sea salt, and pepper before you put it in the oven. You can also mix coconut oil with almond butter and use it for dipping apples. This allows you to get a good source of fat in your diet, balance your blood sugar, and also give you a burst of energy. This is a good midday snack when many people’s blood sugar starts to dip and they want coffee or sugar to help them get through the rest of their day. Coconut oil is great for cooking and baking. You can use coconut oil in recipes instead of other healthy fats like butter, but also unhealthy fats, like margarine and vegetable shortening. Coconut oil is great for making cookies, pie crusts, pudding, bars, and cakes. Many of the recipes in our Well of Life cookbooks include coconut oil. Coconut oil can also be used to grease pie pans or to make pancakes on a griddle. Coconut oil definitely has great health benefits when ingested, but it has many other uses as well. It can be used as a face and body moisturizer. It can be a bit greasy, so you may want to use it at night. I do have clients and coworkers that use it in the morning, and it does work for them. We had one employee whose cat would lick it off her legs! I have had clients give coconut oil to their pets – they need good nutrition too. Some clients use coconut oil to give their pets their medication, or just put it in their food. All pets have different health situations, so you should always check with your veterinarian first. You can also use coconut oil as a conditioner in your hair. Many quality, natural shampoos and conditioners contain coconut oil. Coconut oil is great for rashes, burns, cuts, and scrapes. It’s always a good idea to have the rash checked out by a clinician to identify the root cause. For example, it could be the body pushing fungus or chemicals out through the skin. Many people come to the Well of Life to get rid of rashes, eczema, or psoriasis. There is always a reason. To truly get rid of the skin issue, you need to find the cause, and then support the organs that allow the body to get rid of it for good, like the lymphatic, spleen and kidneys. 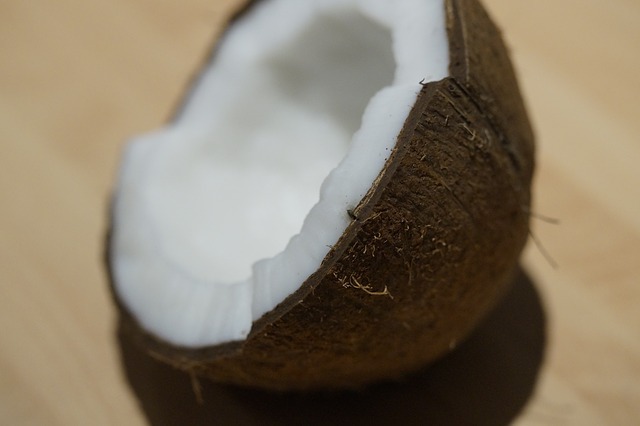 Coconut oil is a mild antimicrobial agent, but also encourages healing to the skin. It can also be used for poison ivy. I remember one year my daughter got poison ivy really badly. She tried everything topically, aloe, even Calamine lotion. She was desperate. Another clinician at the Well recommended coconut oil. I told my daughter, and she said, “I am not putting a food on my skin!” Well, she couldn’t take the itching anymore, so she tried the coconut oil, and it worked! It took away her itching and also made it dry up, believe it or not. The best type of coconut oil to buy is raw, certified organic, and unrefined. There are many brands of coconut oil on the market, especially now that it has become more popular. Manufacturers want to get on the bandwagon with whatever is the hot item to sell. They try to produce the item inexpensively to make the most profit. Extra virgin and virgin coconut oil really have no differences. They are both less refined and contain more nutritive value. Refined coconut oil has been processed like other poor quality oils, like canola oil. They can be bleached and deodorized. However, refined coconut oil is still better than canola oil. The Well of Life recommends Wilderness Family Naturals coconut oil. This is now available for purchase on the Well of Life online store on our website!